Could this really work? 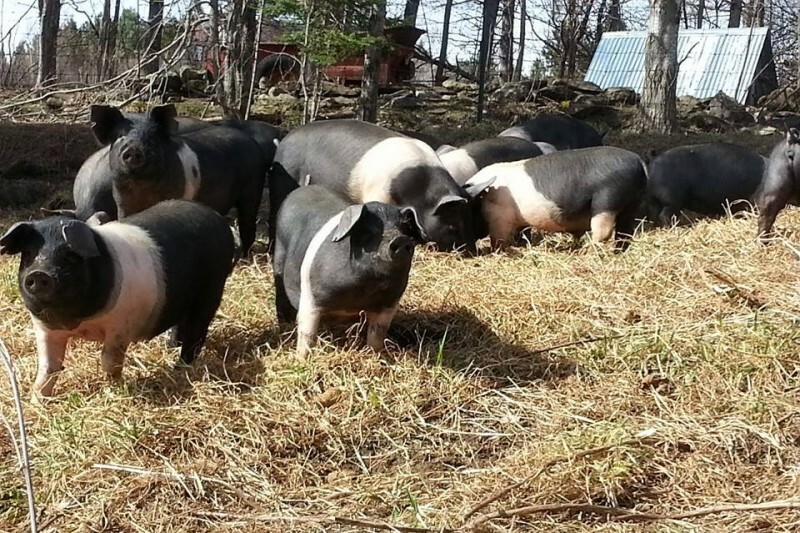 I'm a small scale farmer that raises Heritage breeds of Pigs and Laying Hens. I'm 47 years old but feel like I'm 25! Raised on a farm in Alberta, spent my 20's, 30's in Toronto,, at 42 with a hope and a prayer I left the big bad city and started my farm at my friends abandoned farm. The place was a disaster, previous tenants had burned the barn down, piles of garbage were everywhere, the roof in the house was leaking in several spots, there was no electricy for my first few months and I lived without running water for the first nine months. Despite the challenges my first year I was able to establish a breeding group of both Berkshire and Tamworth pigs and started a flock of laying hens, ducks, a couple "throw calves", Heritage Turkeys and put in a seven acre vegetable garden. It was a rainy year and in hindsight, glad the roof did leak as I was able to collect a lot of water! In between the first year and now I have had much success with my Heritage Eggs and Heritage Pork. It took a few years to realize I couldn't do everything so I started cutting out a few things, the ducks, cattle, geese had to go and I started to focus just on the laying hens and the pigs. I now have registered breeding stock of four breeds of pigs; Berkshires, Tamworths, Herefords and Gloucestershire Old Spots. I am now servicing some very fine restaurants and boutique Butcher Shoppe's in and around Toronto. It has been a long haul and I've had many ups and downs, but I am committed to this type of farming; raising livestock and poultry humanely, outdoors, non-GMO feed and of course with no antibiotics and hormones. I've always wanted Saddleback pigs, I first became aware of them sitting in my apartment while living in Toronto watching the BBC program Jimmy's Farm. This show along with my families farming heritage is the reason why I decided to leave the city and start this farm. In the show Jimmy Doherty leaves London to start his farm and butchery, he was on a quest to save the Essex breed of pig, the Essex, along with the Wessex is the Saddleback Pig. In the UK the numbers of Essex and Wessex were so low that they combined the two breeds as they were so similar and the bloodlines not diverse enough individually to expand without the amalgamation of the two breeds into the British Saddleback. Saddlebacks were once in Canada but the last registered stock on the Canadian Livestock Registry were in the 1980's. In the United States the breed is very rare but after sending some messages to a well known breeder in England, he sent me to a breeder in the US that had imported a herd a couple years ago and also had an existing American herd. This is where the pigs I'm acquiring come from. Importing pigs into Canada from the US is not an easy task. Pigs must be tested for several diseases two weeks before they are to go to the Canadian Food Inspection Agency's quarintine facility where they spend 30 days and then are tested again. If all tests come back negative they are released to the owner. Biosecurity at the facility is top notch, vehicles arriving in to deliver must be clean and vehicles and trailers picking up must be disinfected. The costs are high for the tests and for the pigs stay at the faciltiy. Why am I taking this route to finance which really is a private business? Well last summer I was put on the waiting list for the quarintine facility and was told it would be 14 months before I had access. Because of some cancelations I kept getting bumped up and it caught me off guard that if I don't have my pigs there by the first of April, I go back to the end of the list. Summer on the farm is when most of my income is generated, coming at the end of winter I'm simply not flush with cash. How much do I need? I'm bringing in 5 females (gilts) and 2 males (boars). The gilts are $1200 each and the boars are $1500 each, all in US dollars. $9000 US or roughly $11 000 Canadian. I will be able to manage some of the other expenses on my own, transporation from the Eastern US to Detroit/Windsor, fee's for pigs at facility, Vet costs, Import taxes, and transportation from Windsor to my farm. What do you get by donating to this? Unlike modern industrialized farming, I am raising my pigs outdoors, humanely and most important, naturally. All the marketing boards in the world cannot produce pork in those cement and tin warehouses like I do on my farm. By breeding and raising heritage breeds,some very precious genetics are being saved and expanded. I'm finding it strange writing this thinking who the hell is going to give me money to get some piggies! But I do know that there are some like-minded people out there that share my philosophy on farming. Very happy to say that I have reached $2190 in donations so far! Not a charity here, will exchange any donation with food from my farm. Well here's a little story about....well me & the piggies! Good for you Murray. It's a good story! Ensuring the survival of amazing heritage breeds is vital for biodiversity. I am so pleased that some small Canadian farms are taking this on! I hope to do this one day soon as well. Good luck, they are a gorgeous breed. Murray you deserve to be successful. Go for it ! Good luck! Amazing cause! When is your deadline?? Some day I would love to visit your Farm.